RCI 32nd International Convention & Trade Show - Zero/Six Consulting, LLC. 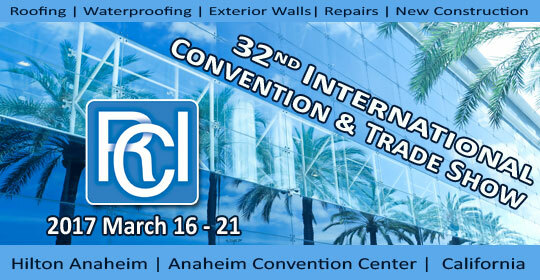 Zero/Six Consulting is excited to announce we will be speaking and exhibiting at the RCI 32nd International Convention & Trade Show in Anaheim, CA from March 16 – 21, 2017. This convention is the premiere event for building envelope consultants who specialize in design, investigation, repair and management of roofing exterior wall, and waterproofing systems. This 6 day conference will bring together over 130 exhibitors and 1,300 attendees, featuring over 25 hours of educational seminars, live product demonstrations, and a two‐day trade show. Join us in the conversation as Zero/Six’s President, Bill Coltzer Jr., AIA and Director of Simulations, Christian Ozbun, RA discuss, Optimizing the Building Envelope with a BIM-based Framework, on Monday, March 20, 2017 from 8:45 – 10:15 A.M. and discover how BIM is a natural extension of the construction process. Can’t make it? An encore presentation will be given on Monday, March 20, 2017 from 10:30 A.M. – 12:00 P.M.
To learn how Zero/Six can work with you to build a better building envelope, stop by our Booth 339 in the exhibition hall and our specialists will answer any questions you may have or just stop by and say hi to our team! Note: Educational programs are approved to yield continuing education credits for members of RCI and the American Institute of Architects. Click here to learn more about the 32nd International Convention & Trade Show. Don’t miss our Case Study at the RCI Convention! Imagine putting together a puzzle with pieces designed by ten different companies. The building envelope process is like that puzzle; it is made up of an aggregate of multiple designs coming together for the first time onsite. Building Information Modeling (BIM) puts all the pieces together virtually so that multiple design elements come together onsite with design mistakes and oversights identified and corrected. In 2015, Zero/Six collaborated with Hensel Phelps to assemble the pieces in a BIM framework to coordinate shop drawings for a 432,671 square feet (sq. ft.) facility. Numerous architectural and structural drawings multiplied the potential for discrepancies both before and after construction. By combining the envelope drawings and structural model into an intelligent 3D design we were able to identify issues that would have been costly to remedy once the pieces came together onsite. Our research presents an overview of BIM for engineers, architects and construction professionals to optimize the building envelope through BIM workflow processes, organizing the model by trade, project sequencing, and generating quantities directly from the data. BIM allows us to put the building envelope puzzle together before dumping all the pieces out of the box. Project Sequencing: Not only must the BIM model take into account each contractor’s scope of work, but phasing must be done to ensure trades don’t conflict with each other. The model takes into account the order in which each item is installed. Organizing the Model by Trade: A BIM model can be used to separate each contractor’s scope. Architectural drawings look mainly at design intent (how it looks) and where components need to be located. A coordination model looks at which contractor will be installing each specific item. Generating quantities directly from the data: Since each item has embedded data in it, it’s possible to get a material quantity generated directly from the model so each subcontractor knows how much material they can expect to use.